…………………. Get your buzz right here! 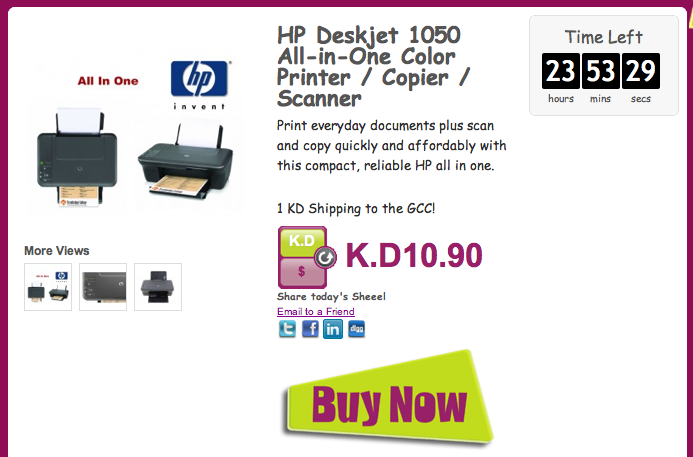 Get a brand new HP All-In-One Printer-Scanner-copier for just KD 11 from Sheeel.com. A very amazing price, for a solid reputable all-in-one device. You can’t beat HP, they rule the printer kingdom. Update: Apparently, there’s a lot of negative feedback about this particular printer, check amazon for more details Thx Ims for the tip. Ouch, that’s embaressing…. Thx for telling me, let me update the post. The price is cheaper than Amazon I agree, but what’s the point buying something then it gets damaged!